If you’re interested in holding an exhibition at the Level Best Art Café this page should give you all the information you need. If you have any further questions just pop in or get in touch. To hold an exhibition at the Art Café you will need to pay £15 and fill out a registration form (You can download a registration form here). We provide local publicity for exhibitions in the form of posters and online promotion via our blog and social media (there is no extra charge for this, we would encourage artists to further promote their exhibitions in order for it to reach a wider audience). Our resident manager will assist in hanging your exhibition and will be on hand to offer help and advice to you throughout your exhibition but the artist must be present on the hanging day. We can arrange a private view for your exhibition any weekday from 5pm-8pm. This is a good opportunity to showcase your work to a wider audience and friends and family. Our resident manager will be on hand to help host your event and will promote it locally. We don’t charge for private views but in order to keep to our mission of involving trainees in all elements of what we do, we require a food package to be purchased for these events. Prices for this start at £4.00 per head with a minimum 10 person order. Please check out our catering page for further information or view the registration document above. 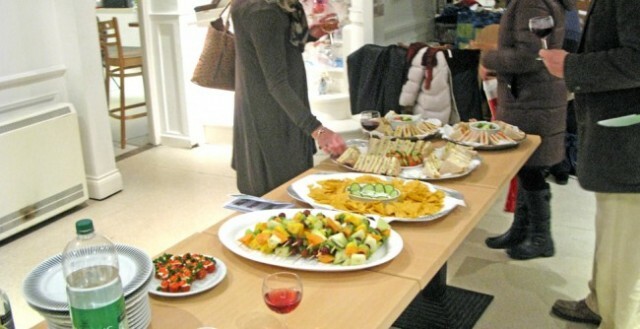 Examples of a private view buffet.